“Hi everybody,hope all of you are doing well! Sorry I have been taking so long to update because there is no internet where I live in Haiti! Since I got back to Haiti I have been working at a community where we don’t have a lot people who was very interested about growing their own food. 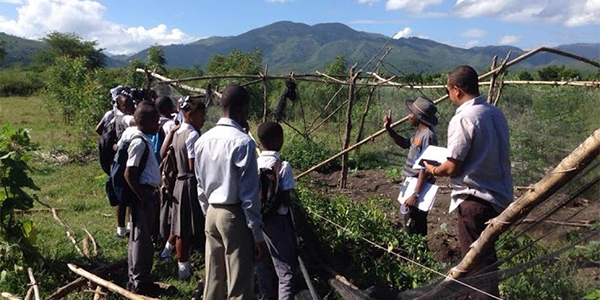 I came here to educate them and make a change to this community, while I am looking for land to start the community garden and a learning center as an example for Haitian people. It’s hard to get land here and land is so expensive! Right now I am teaching agricultural at a middle school and we started a new demonstration garden for this community and to educate local farmers. I also started a compost pile to show them how they can build their own compost with junks from the kitchen and garden stuffs. My presence here is changing this community because now many people are trying to start their own garden, even on a small plot of garden bed. Even students at my classes are starting their own garden, that makes me feel happy! Here are some pictures, I think you might enjoy seeing our community garden growing up! Thank you so much for supporting me and being my good friends! Stay in touch! View photos he attached to his message here.